You know how you have a great project idea? Then when the time comes to actually make it, you only just then realize you don’t have that one thing you absolutely need. Well, that’s exactly how my DIY Halloween bat soap was born. If you recall from my Halloween solid lotion bar recipe, I have this super cute silicone Halloween soap mold. Not only does it have a toothy bat mold, there’s also a witch, two pumpkins and a sweet little sugar skull. As sugar skulls were trending on Pinterest, I really wanted to make little sugar skull soaps. I was planning to dust the inside of the mold with biodegradable eco-friendly glitter in a collection of bright colors. Then fill it white melt and pour soap. The finishing touch, however, was going to be painting on details with cosmetic mica powders. As it turned out however, I realized as I was gathering all of my materials for my sugar skull soaps, I didn’t have that one crucial supply. Ordinarily I pretty much have everything I need to create just about anything. Despite scaling back on soap making supplies with each move, I alway have more than enough to throw an impromptu craft party. However, with my divorce finally (FINALLY!) final, I’m in the process of moving in with my boyfriend. Because of that, not everything I need is in his apartment yet. Some of it is still at my friend Bambi’s house. Rather than take a fifteen minute drive, lose a half hour and as a consequence also lose my motivation in the process, I opted for a DIY Halloween bat soap instead. With glitter. (I mean there’s no time to start sullying someone else’s apartment with glitter than the present, right? By now you’re probably wondering what the heck I didn’t possibly have on hand for those sugar skull soaps if the glitter was a go. In the end, my project was derailed by an absent paint brush. Oddly enough, Greg and I had also just run out of Q-tips. So my back up plan was also a no go. I’m a little dismayed I likely won’t be able to make my sugar skull soaps in time to blog for Halloween. 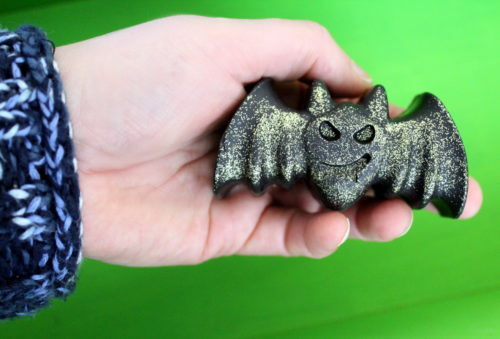 However, I actually love how my DIY Halloween bat soap turned out. It’s cute. It was fun to make. 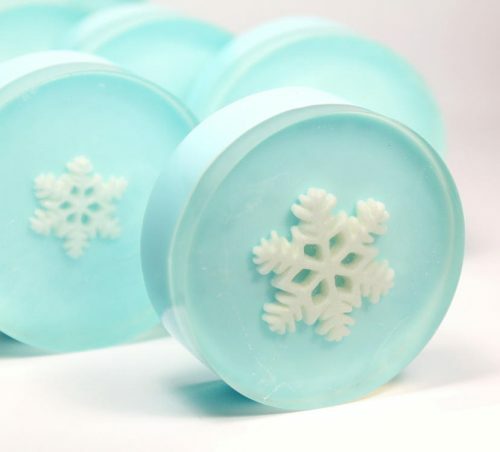 And now I have a really easy soap making project to share with you! 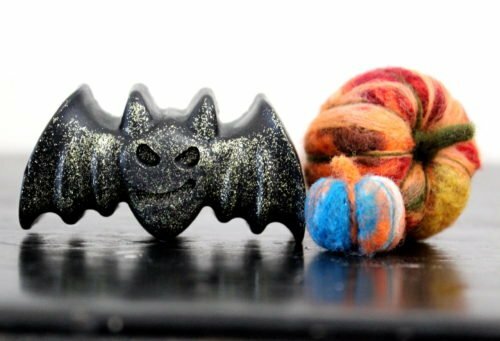 My DIY Halloween bat soap recipe will yield a single bat soap. If you’re interested in making additional soaps for the silicone Halloween soap mold that I used, I did get the approximate amount of melt and pour soap you need for each cavity. Keep in mind that this is by weight. Additionally, as not all soap bases weigh the same amount, weights may vary slightly from base to base. Amount of melt and pour soap (by weight) needed for each cavity. Middle pumpkin – 2.1 oz. Witch hat – 2.35 oz. Bottom pumpkin – 2.15 oz. 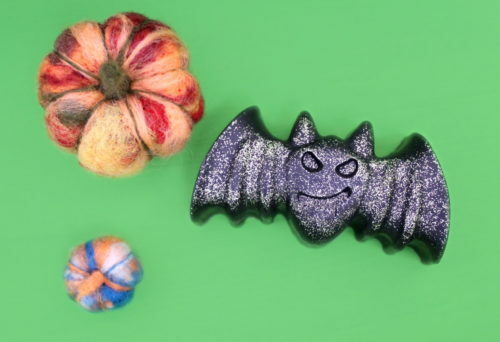 To recreate my DIY Halloween bat soap, you will need several supplies. These include the following. Using a digital scale, weigh out 2.15 oz. 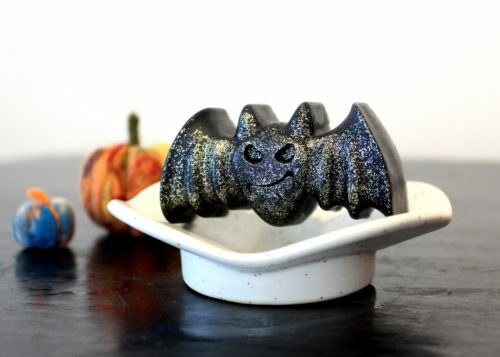 of clear melt and pour soap base for your DIY Halloween bat soap. Cut into chunks with a knife. 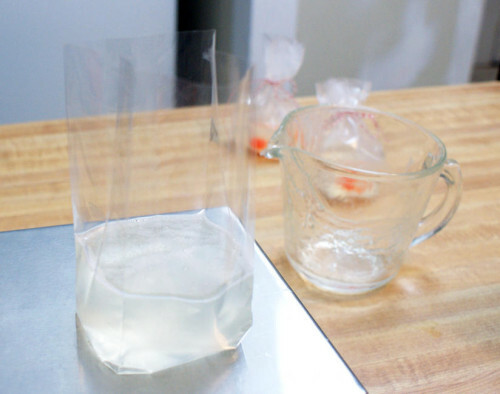 Then place the soap into a heat safe glass measuring cup. Heat the soap base in the microwave in 20-30 second increments until melted. Be sure to stir the soap after heating. Once the soap has melted, add a small sliver of the black color black. Stir the soap until the color block has completely melted. (Alternately you may also use a pinch of black mica.) You can add more color as needed. However, keep in mind that overuse of colorants may cause the soap to bleed and can potentially stain skin. Now add your desired amount of fine, cosmetic eco-friendly biodegradable glitter in your color(s) of choice. (For a more subtle sparkle, try this eco-friendly ultra fine biodegradable glitter instead.) Stir to incorporate. Using a plastic transfer pipette or dropper, add the peppermint essential oil to the melted soap base. Mix again. Place your soap mold on top of a cutting board. 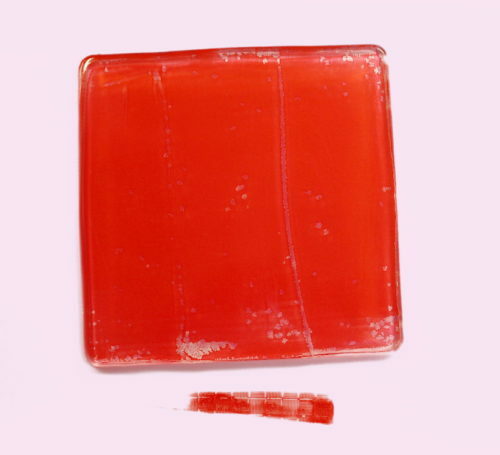 Once your soap has cooled somewhat and starts to develop a film on top, remix the soap. Then pour the melted soap base for your DIY Halloween bat soap into the bat cavity of the mold. Spritz the soap with rubbing alcohol to remove any air bubbles. Using the cutting board for support, transport the soap mold to the refrigerator. Allow the soap to cool and completely solidify. 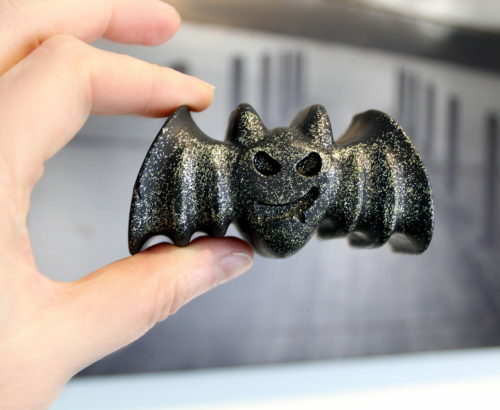 Once your DIY Halloween bat soap has hardened, remove it from the mold. Wrap it tightly in foodservice film until ready to use or to give as a handmade Halloween gift. 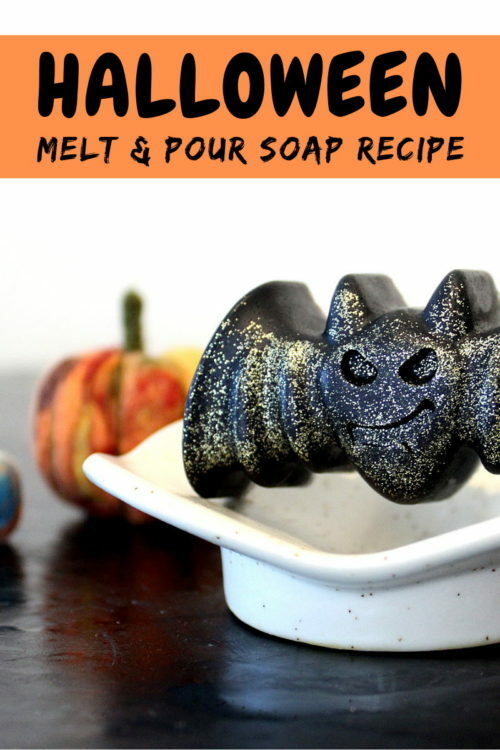 If you enjoy making my DIY Halloween bat soap, then you may also want to give these other homemade melt and pour soap recipes a try. Also be sure to follow my Simply Soapmaking board on Pinterest for more great DIY soapmaking ideas you can make at home. 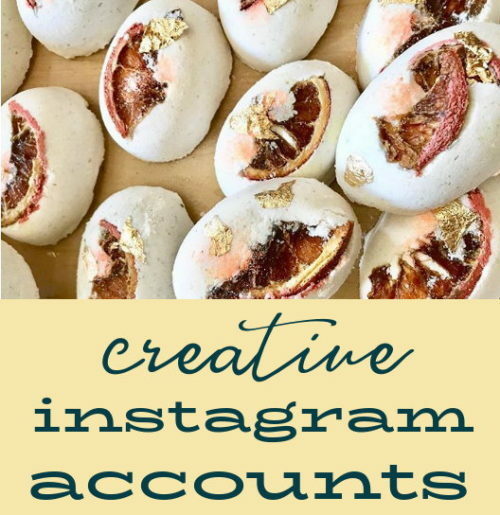 For more great homemade soap recipes and project ideas, as well as updates from Soap Deli News blog, be sure to follow me across all of your favorite social media platforms. You can find me on G+, Pinterest, Facebook, Twitter, Blog Lovin’ and Instagram. Alternately, you can also subscribe to Soap Deli News via email for future updates, DIY projects and recipes. Bring a little extra light and some smiles into your life, regardless of the time of year, with this easy and fun DIY suncatcher craft project! It’s a great way to add a little more self care to your life! It’s easy to feel overwhelmed throughout the fall and winter holiday season. On top of the pressures of work and parenting, there are holiday activities to contend with. Not to mention all those holiday family obligations that we sometimes wish we didn’t have. Like you, there are days I just need a break. For the rest of the year, I’ve promised myself I will do just that. As I tend to isolate myself more during cold weather months, part of my plan for self care is to get out of the house and socialize more. To help me find activities I know that I’ll enjoy, I’ve been keeping a steady eye on upcoming Facebook events. For events I’m interested in, I mark as “interested” so I get a reminder via Facebook a few days before. However, for events I’m kind of crazy about, they get put on my paper wall calendar. (Yes. Yes. I have one of those.) This way my favorite events won’t slip my mind. While my final decision for Halloween activities is still up in the air, I have committed myself to several activities for October. Events like an art exhibition opening at a local gallery, music at a local restaurant, a monthly Wine & Art Wednesday, and another monthly event pegged Rooftop Riot for my BFF’s birthday. Of course, since my boyfriend Greg goes to most of these things with me, I’m having to schedule around football. Luckily, most live bands play at restaurants with televisions. (So he can’t cop out. Bwahahaha.) He’s been a real sport about trying new things though. It can be hard to put yourself out there if you don’t a sidekick. So he keeps me honest so I don’t bail to binge on Netflix instead. 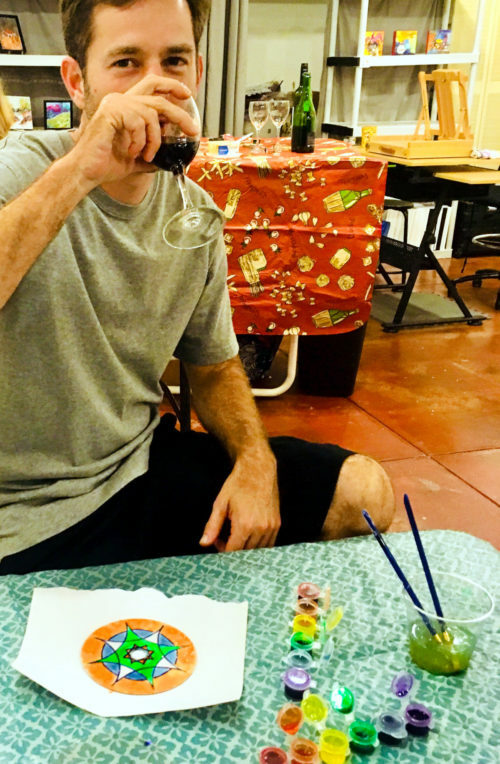 Last month Greg tagged along for Wine & Art Wednesday. It’s run by my friend, Hillary, so it’s a great opportunity not just to see my friends, but to meet new people AND get crafty. I took along some wine from my new Winc shipment (the 2016 L’Atelier du Sud Red Blend and 2017 Finke’s Sparkling White Blend, both of which were amazing!) and we spent the evening crafting our own DIY suncatchers. While suncatchers seem like they might be seasonally specific, I think that this craft project is great for anytime of the year. This would be a great project for winter to help you overcome seasonal depression and allow a little more light into your life. Plus it’s the perfect chance to create imaginative snowflakes or winter themed flamingos for your windows! There are several things that I really love about this DIY suncatcher craft project. One, you repurpose old or scratched CD’s for this project, so it’s not going to cost a lot of money. Two, you don’t need to be an artist to make these suncatchers. You can easily trace your favorite designs onto the cd’s. Or, you can freehand an abstract idea. 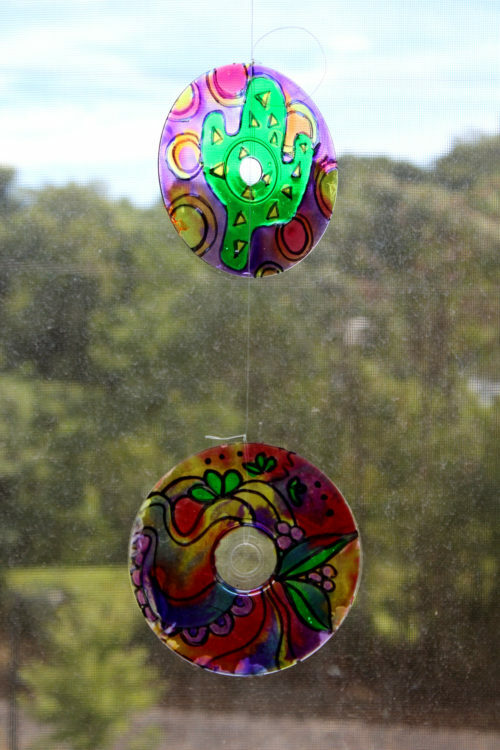 And three, this DIY suncatcher craft project is amazingly therapeutic. I’d had a terrible week leading up to making these suncatchers. However, by the time Wine & Art Wednesday was over, I was in great spirits. Ready to give this DIY suncatcher craft project a try? Following is an easy tutorial and photos from my Wednesday night to walk you through the process! You’ll begin by removing the painted layer from your CD. 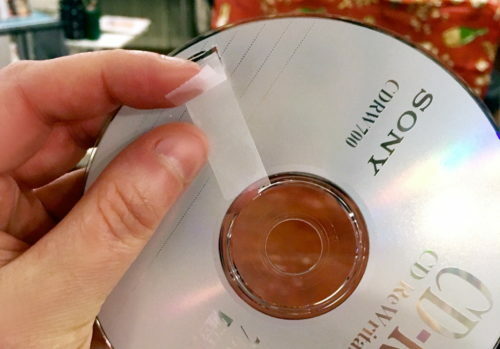 To do this, simply place a piece of tape over the painted side of the CD with one end hanging off the edge of the CD. Lift the edge of the tape by the outer edge of the CD slightly. Then take a pair of scissors and scratch off a small amount of the coating under the outer edge of the tape. Press the tape back down over the scratch you made. 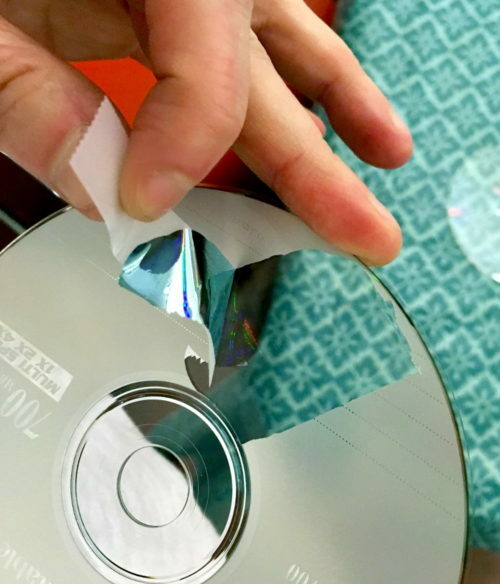 Then pull the tape away from the outer edge of the CD. That painted layer or coating will pull right off! (I never would have believed it was THIS easy!) Repeat as needed until all of the coating has been removed and you’re left with only the clear CD plastic. 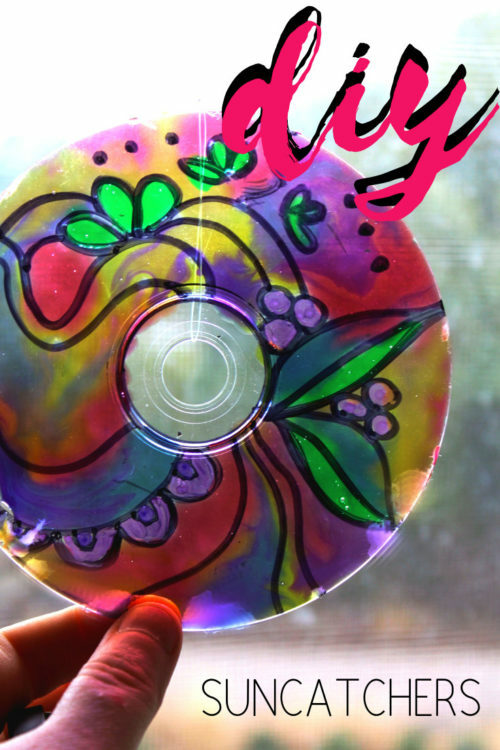 Next, use a permanent marker or paint marker to draw your design onto the CD. 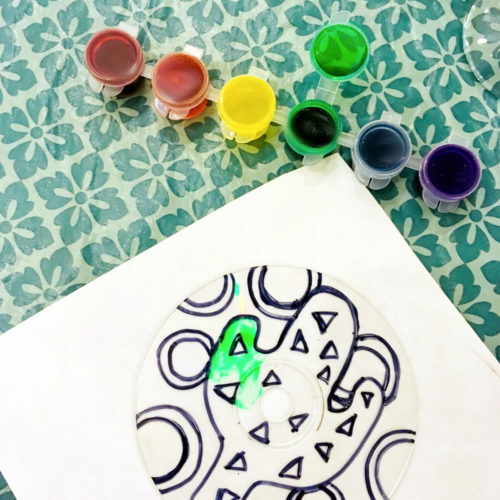 You can either trace a design onto the CD by placing an image or mandala pattern under the CD or you can draw your own design. Once you’ve drawn the outline for your DIY suncatcher craft project design, you can either use suncatcher paints or permanent markers to color in the design. 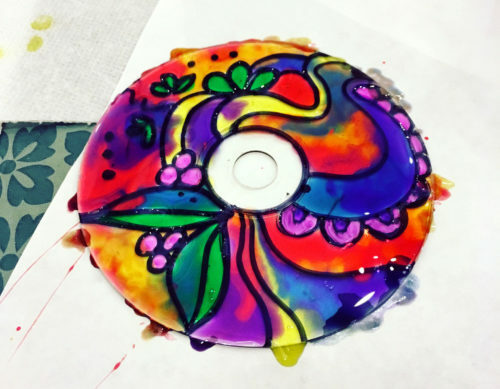 Allow your suncatcher to dry completely, then tie a length of fishing line through the hole in the CD so it can be displayed. You can also add beads to the fishing line both above and/or below the CD for an extra decorative touch. It’s that easy! If you enjoyed my DIY suncatcher craft project, then be sure to check out some of my other craft project ideas on Soap Deli News. You can also follow my DIY Craft Projects board on Pinterest. Alternately, you can also shop for all inclusive DIY craft kits for one stop shopping. For more great project ideas from Soap Deli News blog, be sure to follow me across all of your favorite social media platforms. You can find me on G+, Pinterest, Facebook, Twitter, Blog Lovin’ and Instagram. Or, alternately, you can also subscribe to Soap Deli News via email for future updates, DIY projects and recipes. 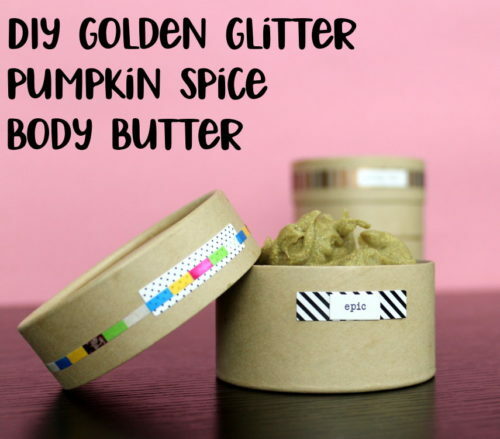 This golden glitter pumpkin spice body butter recipe will have everyone raving about how amazing you smell! A must have for seasonal holiday parties, not only does this moisturizing pumpkin spice body butter smell just like everyone’s favorite pumpkin pie, but it also makes skin pop with glitzy eco-friendly glitter! Plus, this fun sparkly pumpkin spice body butter is a vegan friendly moisturizer so everyone can join in on the fun. 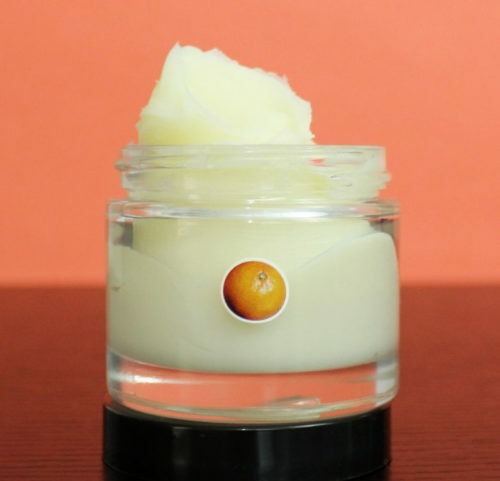 Keep reading to learn how to create this party perfect body butter below! You’ll need a digital scale to make my pumpkin spice body butter recipe as you’ll be weighing out all of the necessary ingredients with the exception of the vitamin E oil. If you are planning to make more homemade bath and body recipes in the future, I highly recommend purchasing a Baker’s Math scale. Weighing ingredients is not only more accurate than using liquid measurements, but it also allows you to easily re-size a recipe by a percentage and figure the correct percentage of essential oils, fragrance oils and preservatives that you would need when changing a recipe or developing your own. Once melted, remove from heat. Then weigh out the pumpkin seed oil and stir into the melted butters and wax. 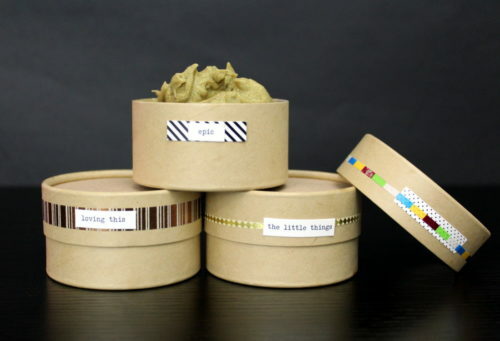 Follow with the fragrance oil and kaolin clay, weighing each ingredient first, then mixing into the body butter. Using a plastic graduated transfer pipette, measure out 1/2 mL (or about 10 drops) of the vitamin E oil and mix in. Finally, weigh out the glitter. (I used eco-friendly biodegradable glitter from The Sparkle Party.) Use .4 oz. of glitter for a bold look or half the amount for a more subtle appearance. (Alternately, if glitter isn’t your thing, you can simply omit it entirely.) Whisk the glitter into the body butter mixture with a fork until well combined. 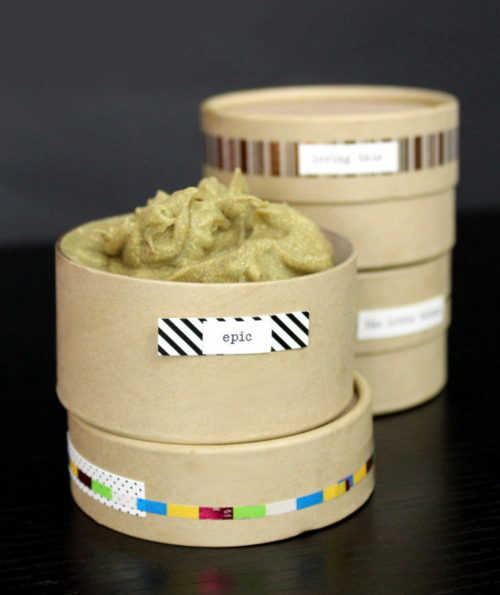 Once your pumpkin spice body butter fully solidifies, cap and label your container as desired for personal use or gifting. Washi tape and scrapbooking/planner stickers are a simple and easy way to add a bit of pizazz to your jars. If you want to recreate my pumpkin spice body butter recipe to sell, you’ll need to follow good manufacturing practices (GMP) when making your product. You’ll find that the book, Good Manufacturing Practices for Soap and Cosmetic Handcrafters by Marie Gale, is a valuable resource if you’re just getting started making your own homemade soaps, skin care products and cosmetics. In addition to GMP, you’ll also need to follow FDA guidelines for labeling your products. If you’re unsure about the rules and regulations regarding labeling cosmetics, the book, Soap and Cosmetic Labeling: How to Follow the Rules and Regs Explained in Plain English by Marie Gale, spells out everything you need to know to legally label your products. If you like my golden glitter pumpkin spice body butter recipe, then you may also like my recipe for making a fun, kid-approved unicorn glitter butter! 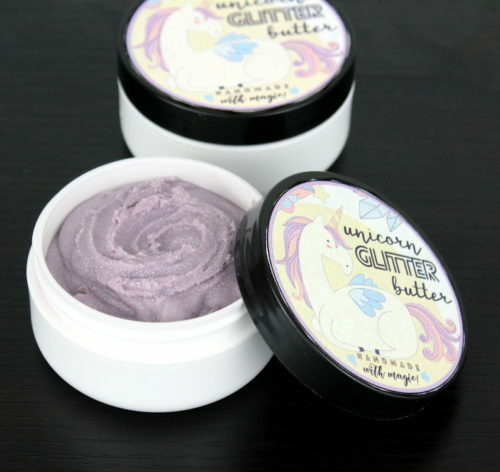 Scented with a sweet candy crush fragrance oil, this lavender colored unicorn glitter butter leaves a lovely layer of iridescent sparkly glitter on skin wherever it’s applied! You can find my unicorn glitter butter recipe here. If you prefer glitter on special occasions only, then some of my other homemade body butter recipes may be of interest to you. You can browse my full collection of homemade body butter recipes at Soap Deli News blog here. Also be sure to check out my new body butter recipe for making an orange mint body butter at The Nourished Life blog. In addition, if you’re on instagram I’d love to see photos of your work! Simply add the hashtag #soapdelishowoff when you post so I don’t miss any of your amazing creations! 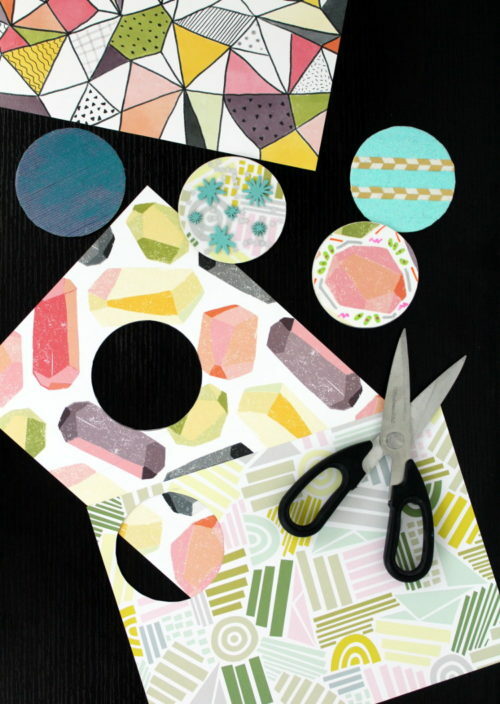 Add some pop to your home decor with this fresh and fun DIY Gelli Printing Tutorial! Not only is gelli printing super easy and rewarding, but the availability of all-in-one kits makes this project even easier to dig right into! My friend, Hillary Hardison, recently ventured into self-employment as a full time artist. 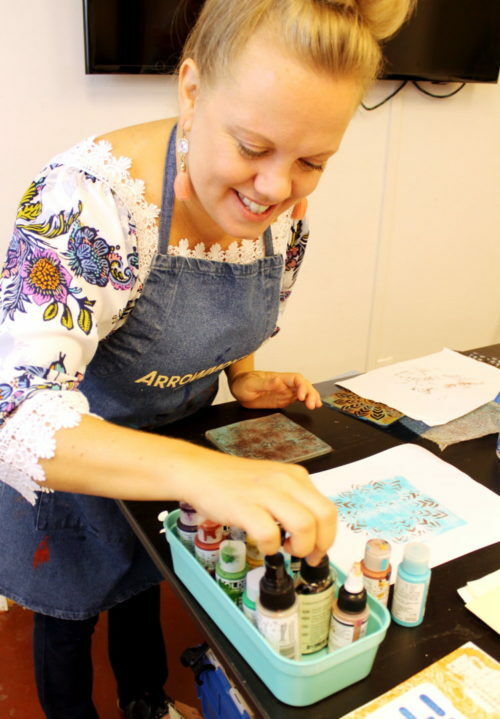 In addition to creating her artwork, which includes a mix of encaustic paintings and mixed media collages, Hillary is also teaching art classes. 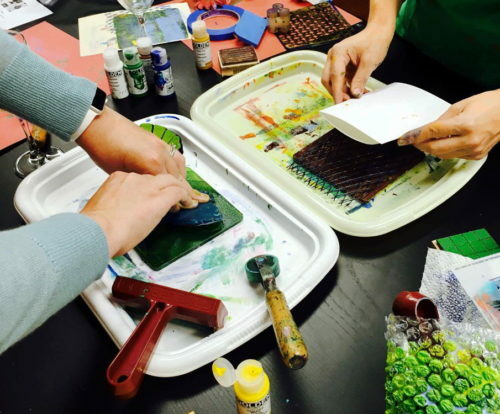 DIY Gelli Printing was the first class she taught as the owner of Hardison Art LLC. Hillary’s first Wine and Art Wednesday was this past Wednesday. 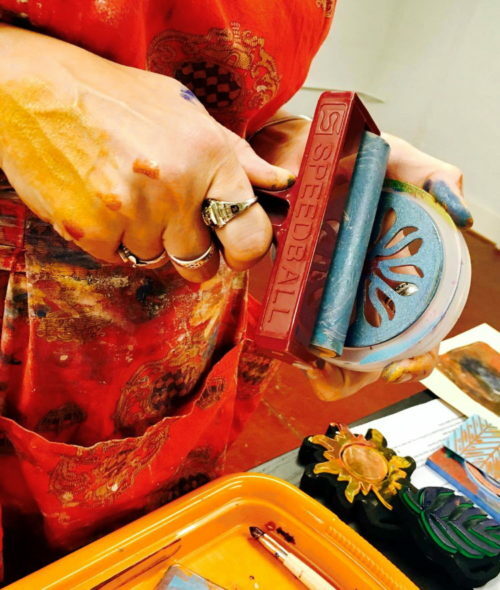 I was fortunate enough to be able to attend this event in which she taught DIY gelli printing. Everyone had an absolute blast. 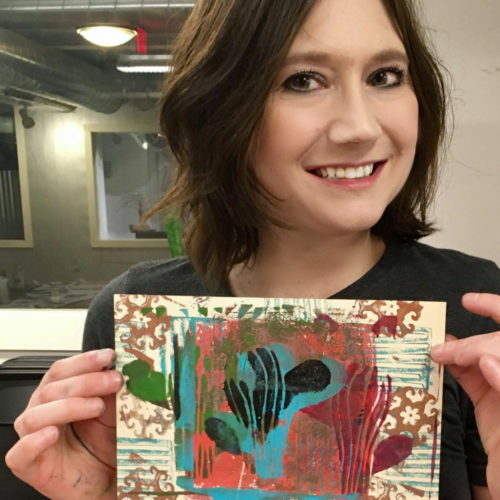 Not only was the process of learning how to create gelli prints an informative and rewarding experience, but Hillary’s bright and positive personality made this class a complete gem. 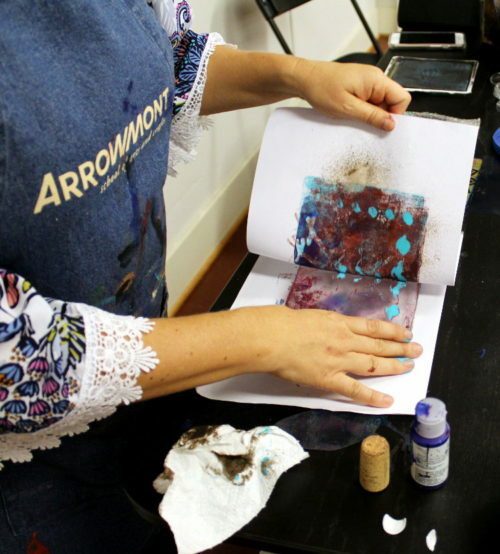 What is DIY Gelli Printing? 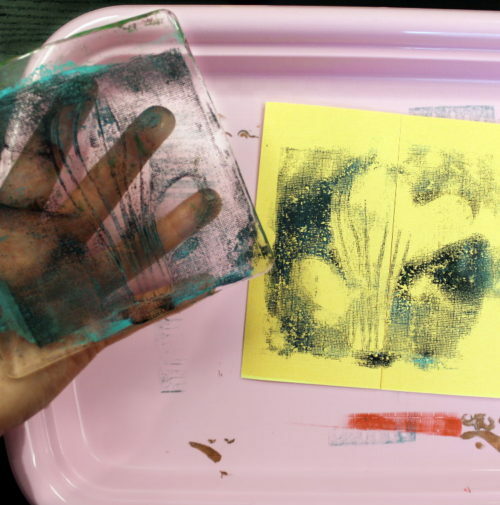 Gelli printing is monoprinting using a gel printing plate. 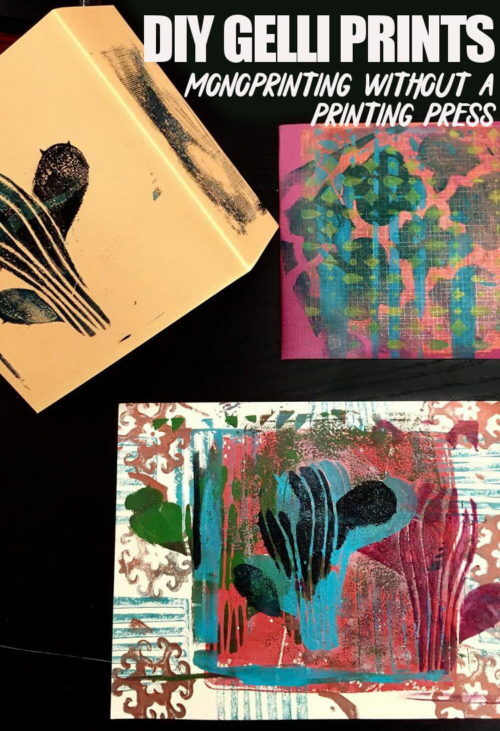 Because Gelli Arts® Gel Printing Plate is made out of a gel, it’s extra sensitive surface will imprint any texture that it is sitting upon or covered with. 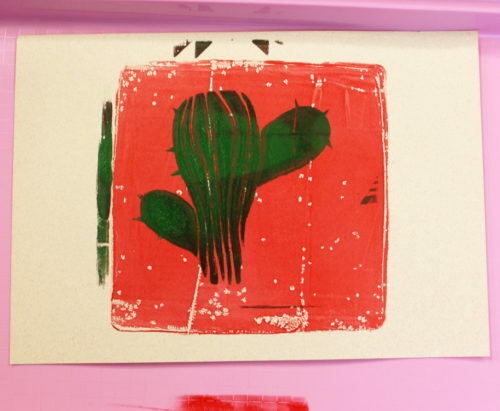 So you can use materials such as bubble wrap, plastic grids, foam stamps, stencils, leaves and string to create unique and beautiful prints. Made using mineral oil and a hypoallergenic polymer material, this vegan monoprinting gelli plate is both vegan and latex free. 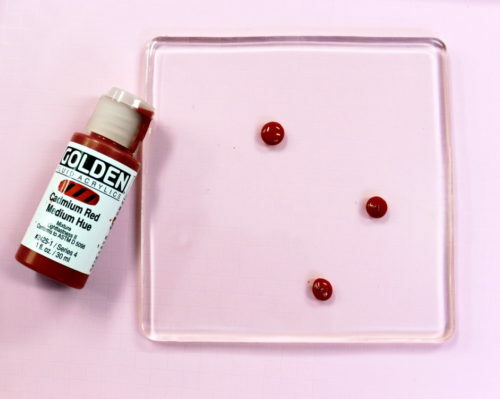 As it’s not made using gelatin, which was the traditional method, there’s no shelf life so you are able to use your gelli plate over and over again. As I enjoyed Hillary’s class on DIY gelli printing so much, I thought it’d be fun to share the process with you all as well. 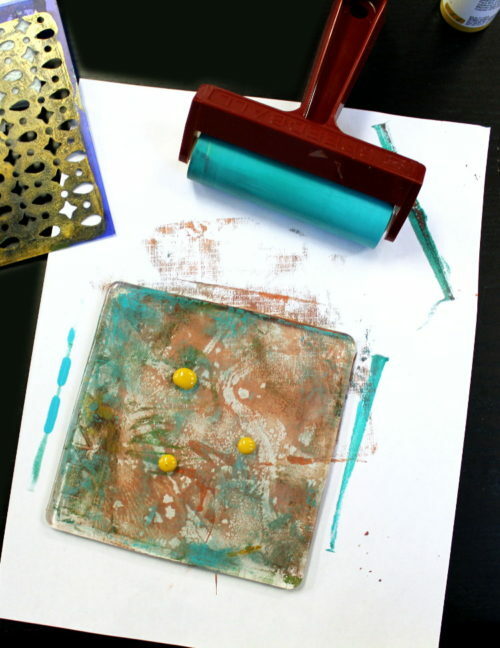 Following is my step-by-step tutorial on DIY gelli printing using the Gelli Arts® Gel Printing Plate. 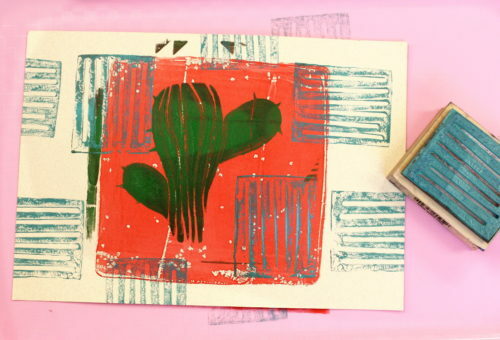 DIY Gelli Printing with Hillary! Begin by gathering all of your materials, then cover your work surface to protect it from paint. 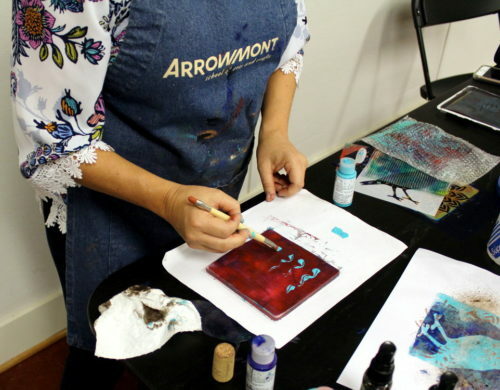 Apply a few drops of acrylic paint to your gelli plate. 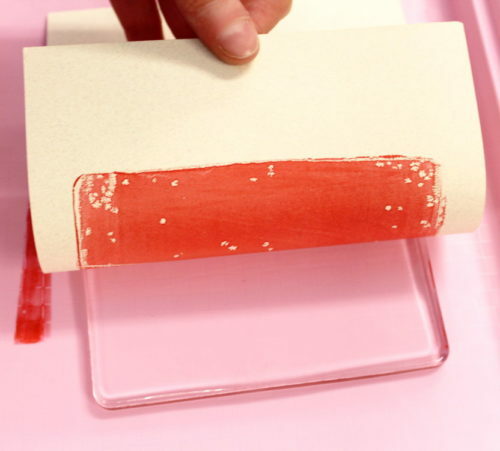 Then use a brayer to smooth the paint out across the surface of the entire plate. Press paper (or fabric) firmly onto the gelli plate with the paint side up. Then remove the paper. You’ve now created the background for your first gelli print! For the next step I used a stencil. 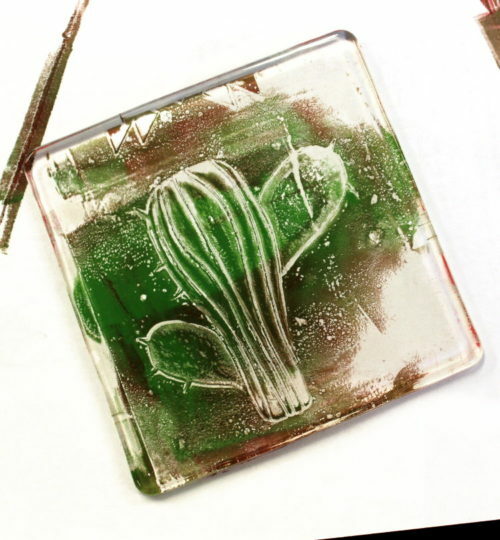 Once again add a few drops of paint to the gelli plate, then spread the paint over the surface using a brayer. 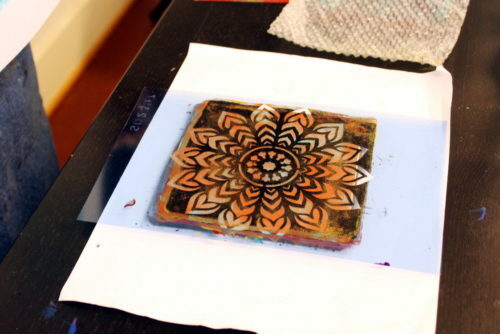 Place the stencil on top of the gelli plate with the paint side up. 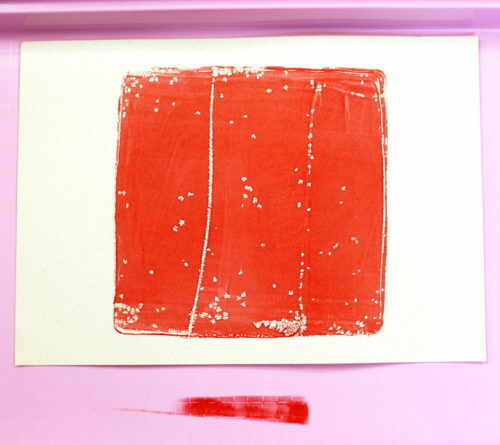 Remove the paper from the gelli plate. You’ve now successfully created a second layer to your print. 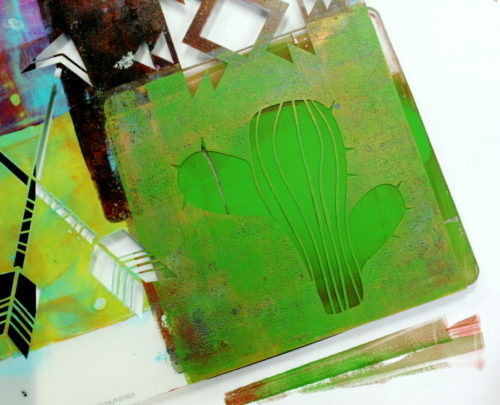 Your gelli plate will retain the portion of the stencil not printed. 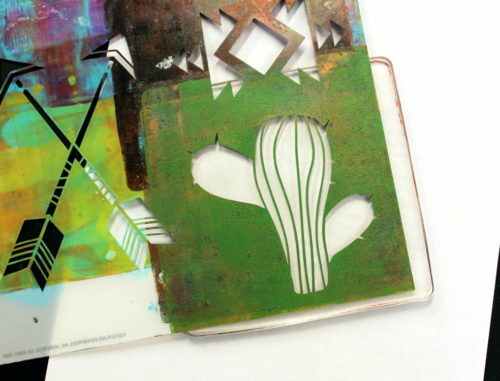 So you can also press a fresh piece of paper on top of the remaining paint on the gelli plate to create a ghost image. Continue creating your print by repeating the previous steps with different stencils and materials. Alternately, you can also roll paint onto a stamp to add to your work. Or try adding additional details by painting free hand using a paint brush. Here’s a shot of me with my first ever gelli print! These are so quick and easy to create that I made several different prints. 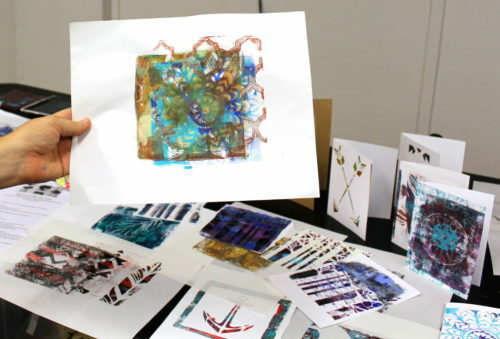 Here is an example of some other gelli prints that Hillary made, including the one she is holding, to demonstrate the process. 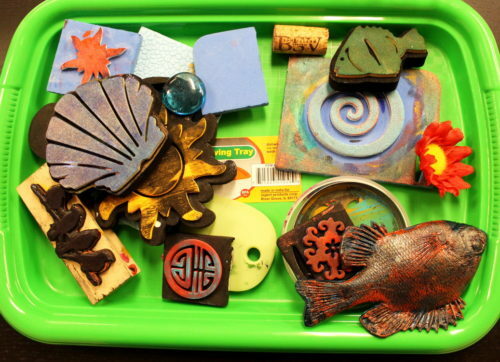 Another fun thing to try with your gelli plate is to apply rubber combs, stamps and brushes to the painted gelli plate to remove paint before printing. 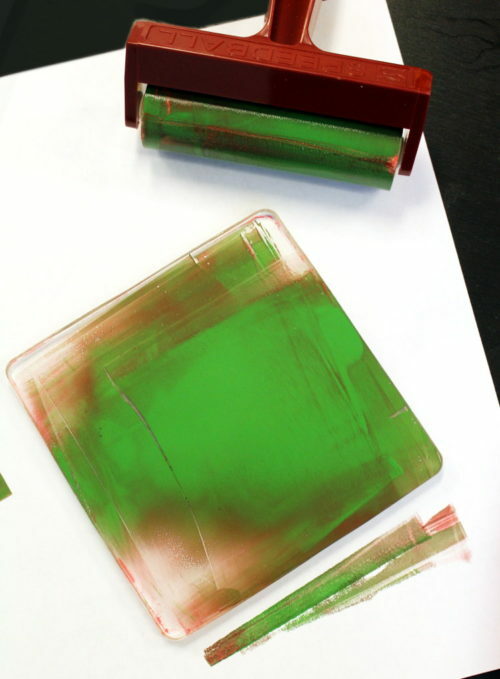 You can also use a spray bottle with water to spray the paint loaded gelli plate prior to printing for a neat effect. 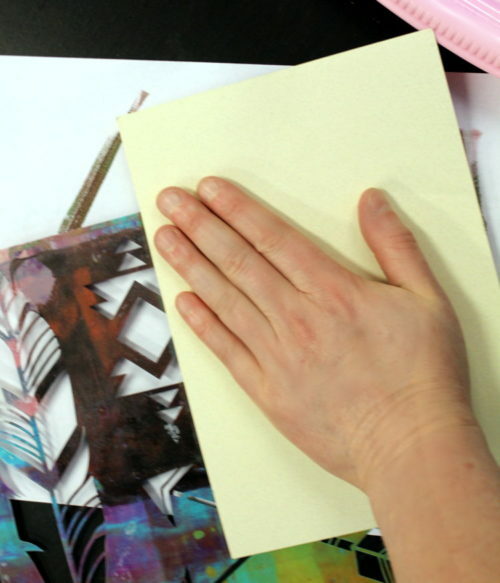 Once you’ve finished making your prints, clean the gelli plate with hand sanitizer and a paper towel. Then place the gelli printing plate between two sheets of copy paper for storage. You can use the DIY gelli printing method to make handmade cards, gift wrap, fabric patches and pretty much anything else you dream up! Alternately, you can also sign up for her Intro to Encaustic Painting Workshop that is being held on September 23rd, 2017 at 1pm. 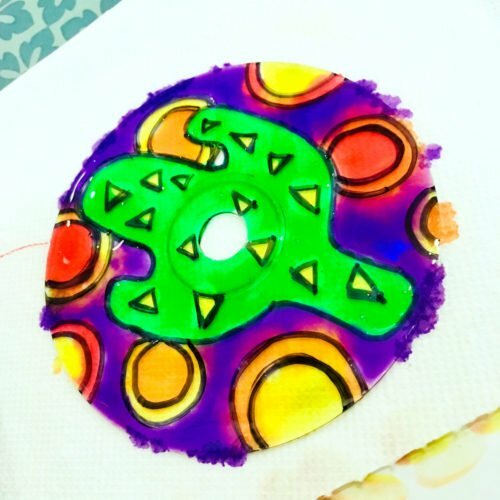 If you liked this DIY gelli printing project, then you may also enjoy my tutorial for making DIY Coasters. Made using blank letterpress coasters, this DIY instructs you on how to make fun and functional coasters for your home and to give as gifts. For more fun art projects and tutorials, be sure to follow my Art Class Pinterest board. You can also follow me on your favorite social media platforms including Pinterest, G+, Tumblr, Facebook, Twitter, Blog Lovin’, and Instagram. Alternately, you can also sign up to receive new posts from Soap Deli News blog to your email via FeedBurner so you never miss a post. And don’t forget to share photos of the gelli prints you’ve made with the hashtag #soapdelishowoff on instagram! I’d love to see the prints that you come up with!